We share a lot of Hennessey Performance videos here at McLarenChat. Usually, we're in awe of the incredible power gains displayed by the cars they've modified. This video is a little different, though. In addition to tuning muscle cars, Hennessey Performance is also all too happy to work their magic on the finest supercars available, making them ever more potent. We've previously shared videos of them working their magic on everything from Camaros to Raptors to a McLaren 720S. This time around, they're working on a McLaren 600LT. In the video, they're performing baseline dyno testing, so that they'll know just how much power they've added when they're through modifying it by comparing the graphs. Stock, the McLaren 600LT is rated at 592 horsepower and 457 lb/ft of torque at the crank. Accounting for 15% drivetrain loss –pretty standard for most cars – you'd expect to see about 503 horsepower and 388 lb/ft at the wheels. However, it turns out that the McLaren 600LT's drivetrain is more efficient than most – much more efficient. 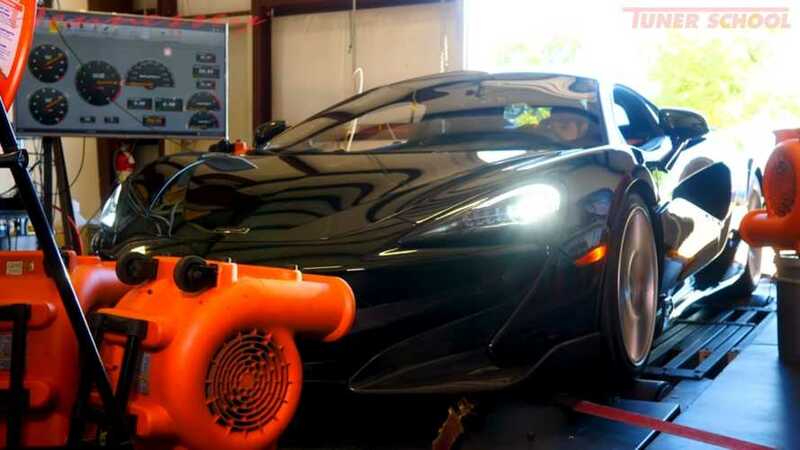 On Hennessey's dyno, the McLaren put down an incredible 574 horsepower at the rear wheels, and a downright shocking 493 lb/ft of torque. That would mean that the McLaren 600LT's drivetrain is only eating up 3% of the power – about one fifth of what you normally see. Furthermore, the torque figures published on McLaren's website are apparently underrated compared to what it's actually putting out. Of course, different dynos produce different numbers, so this car might behave differently on a different dyno. Of course, what we're most interested in seeing is what Hennessey is capable of doing with the already impressive McLaren.